MUSLIM BROTHERHOOD SETTING ITS SIGHTS ON HASHMITE KINGDOM……? – The Tundra Tabloids……. Once the appetite is whetted, their hunger is insatiable. Previous Post Previous Post MUSLIM BROTHERHOOD CANDIDATE FOR PRESIDENT MUHAMMAD MORSI: COPTS NEED TO CONVERT, PAY THE JIZYA OR GET OUT OF EGYPT……. Obama will probably go down in history as one of the World’s greatest idiots. His endorsement of the Muslim Brotherhood shows that this reckless fool cannot be trusted in any area of World politics, never mind being leader of the United States. I sincerely hope that this treacherous clown is not re-elected. If he is I’ll be seriously thinking of emigrating….. to Mars! Jordan needs to play hardball. The Ikhwan has always been strong in Jordan. For many years, they held the largest block in the Jordanian Parliament. As long as the Army is loyal to the King nobody really notices the Ikhwan in Jordan. 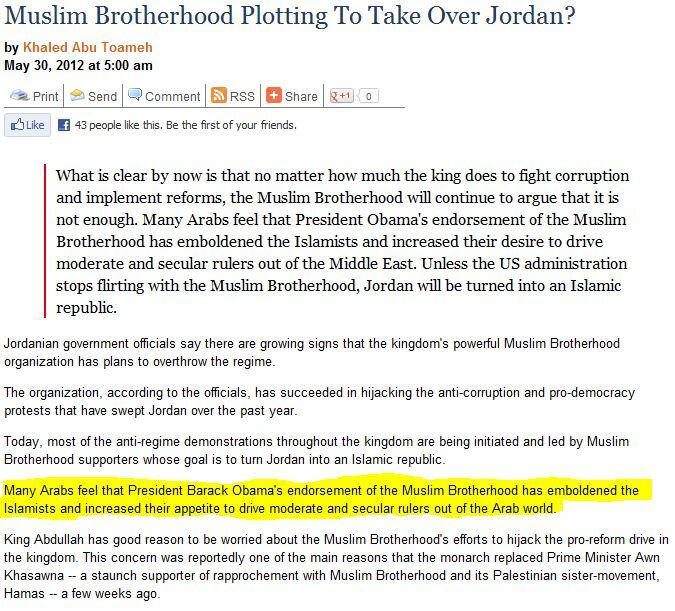 Fortunately, President O’Bama doesn’t have the last word about Jordan. It is intuitively easier for the Jordanian Army to protect the King than it is to fight religious wars against Israel.